Heat the oil over medium-high heat on a large skillet. Add meat, season to taste with salt and pepper and stir to cook evenly. Add the other ingredients and cook for 20 minutes. If you want you can add raisins. You can also combine with ground pork or beef sausage. 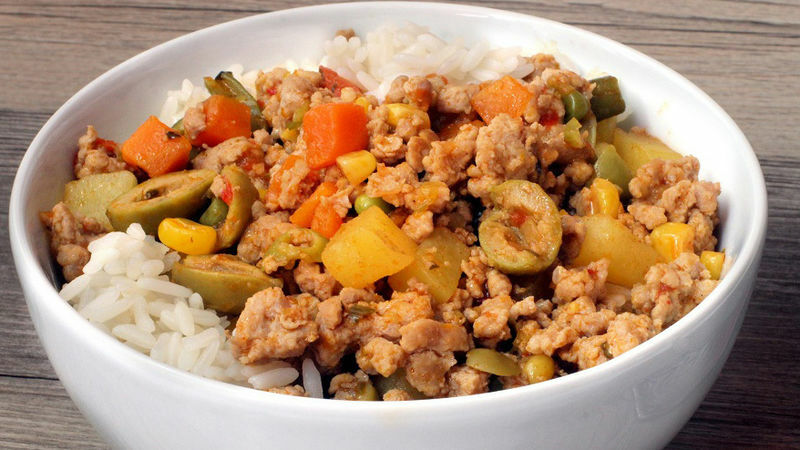 The pork picadillo with potatoes and vegetables is a simple and easy dish to prepare, which makes it a favorite for your family's weekly menu. You can serve it with rice, pasta or toasts, corn or flour tortillas. You can even use it to fill empanadas.